The Syrian Network for Human Rights (SNHR) is a non-profit non-governmental human rights organization that was founded in June 2011 in light of the systematic rise of violations of human rights in Syria. SNHR aims to support the preserving and defending of victims’ right and consequently accounting process, achieve justice and peace, raise the awareness of the Syrian people in regard to their civil and political rights, and amass efforts and capacities in the context of stopping violations of human rights in Syria. The Syrian Human Rights Network works primarily on monitoring and documenting violations in Syria, and publishes research and reports related to such violations, as well as visual evidence from its investigations, such as photos, maps, graphs and infographics, in addition to working on advocacy and mobilization to defend the rights of victims, for justice and accountability in Syria. It also contributes to progress towards achieving justice and accountability in Syria. SNHR is a member of the International Coalition for the Responsibility to Protect (ICR2P), a member of the Euro-Mediterranean Human Rights Network, a founding member and a member of the executive committee of the Transitional Justice Coordination Group (TJCG), and a partner with the Euro-Mediterranean Human Rights Monitor. Additionally, SNHR collaborates closely with the Office of the United Nations High Commissioner for Human Rights (OHCHR), the Independent International Commission of Inquiry on the Syrian Arab Republic (COI), which was established by the United Nations Human Rights Council, and with a number of international human rights organization such as Amnesty International, Human Rights Watch, Reporters Without Borders, Al Karama organization, and The Syrian Campaign, In addition to a number of local Syrian organizations. Euromed Rights [formerly known as the Euro-Mediterranean Human Rights Network (EMHRN)] announced that on 23 and 24 June, 2018, more than a hundred representatives from 80 organisations working on Human Rights on the two shores of the Mediterranean are expected to head to Brussels to attend the 11th General Assembly of EuroMed Rights. As the Euro-Mediterranean region is consumed by the migrants’ impasse, a deep social-economic crisis, the deterioration of international conflicts and the restauration of authoritarian regimes, meetings like this one are more meaningful than ever. Being the only regional organisation that gathers human rights defenders and organisations from both sides of the Mediterranean, EuroMed Rights has a crucial role to play in order to tackle the deterioration of human rights in the region with a strong, common voice. Shackled Freedoms : what space for human rights defenders in the EuroMed? 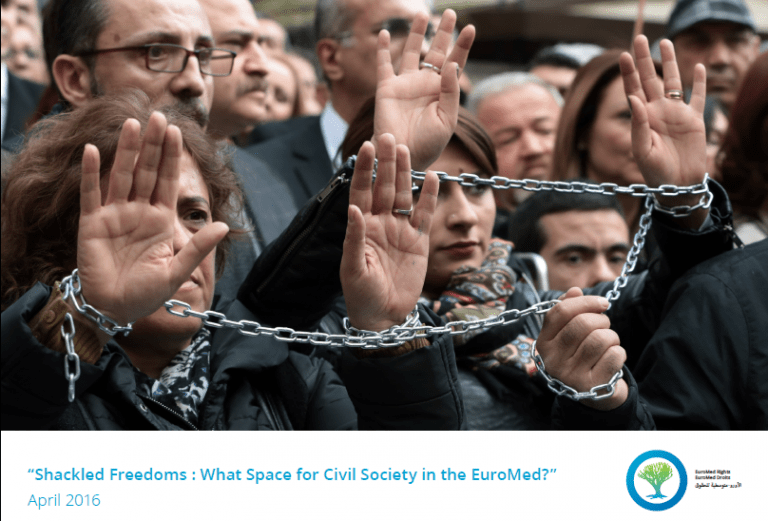 The recent report SHACKLED FREEDOMS : WHAT SPACE FOR CIVIL SOCIETY IN THE EUROMED? depicts the obstacles and repression against civil society in the region and showcases first-hand accounts from Turkey, Egypt, Algeria, Syria, Israel and the Occupied Palestinian Territories among others. The report also features recommendations by CSOs for joint action and seeks to influence EU policies to that effect. The report also focuses on the impact of security and anti-terrorist policies and lists the growing arsenal of repressive measures – both in law and practice – that civil society organizations (CSOs) face on a daily basis: judicial harassment, surveillance, arbitrary arrests, torture and assassination. Despite legal safeguards and the human rights “shared values” rhetoric in the EU, EuroMed Rights argues that European civil society is under increasing pressure. Austerity measures and anti-terrorism laws are increasingly used to legitimise practices that go against individual freedoms and rights of assembly, association and expression, such as in France, Spain or the UK, for instance. The report – published on 7 September 2016 – is the result of a seminar organised in April 2016 as an open dialogue between EU representatives, South Mediterranean activists and Brussels-based CSOs. The Euro-Mediterranean Foundation of Support to Human Rights Defenders (EMHRF) today released its 2013 Annual Report detailing its activities in support of individuals, groups and NGOs who are defending human rights in a wide variety of distinctly challenging contexts across the Arab region. In 2013, when access to internal and external funding sources in the region remained limited and difficult, the Foundation faced the dual challenges of protecting defenders in increasingly repressive and violent environments and of consolidating positive civil society dynamics in countries where tentative steps were taken toward democratisation. On 11 February 2014 five international human rights organisations issued a statement decrying Algeria’s lack of cooperation in allowing UN human rights experts and international human rights organizations to visit the country. Algeria may have joined the UN Human Rights Council in January 2014, but it has not agreed to visits by the UN Special Rapporteur on Torture and the Working Group on Enforced or Involuntary Disappearances, despite their repeated requests. Similarly the Algerian authorities have refused to grant visas to nongovernmental human rights organizations for several years. “Algeria remains the only country among its neighbors that generally restricts access to human rights organizations,” said Eric Goldstein, of Human Rights Watch. [The 5 NGOs making the appeal are Amnesty International, Euro-Mediterranean Human Rights Network, Human Rights Watch and the Observatory for the Protection of Human Rights Defenders, a joint program of the International Federation for Human Rights FIDH, and the World Organization Against Torture OMCT]. Algeria: Allow Rights Groups to Visit – No Response from Algiers to Requests from UN Bodies / February 11, 2014 / Urgent Interventions / Human rights defenders / OMCT. The civil society movement continues to prove to be extremely dynamic and effective in guaranteeing respect for fundamental freedoms and preventing any appropriation of the newly acquired freedoms. Nonetheless, this movement is weakened by significant threats, shortages in human and financial resources and difficulties in joining forces. Particular attention was paid to Syria, Algeria, Tunisia and Egypt. This report is available in Arabic, English and French. On 25 June the Euro-Mediterranean Human Rights Network (EMHRN) published the trial observation report concerning its Executive Committee member, human rights defender and trade unionist M. Osman İşçi. He was arrested in Ankara, Turkey, one year ago on 25 June 2012, and detained at the high-level security prison of Sincan, Ankara, along with another 27 trade unionists arrested on the same date facing proceedings for allegedly supporting a terrorist organization. via Observation of the trial of Osman İşçi, human rights defender and trade-unionist | Euromedrights.